It is a delight for me to attend the Joint Conference of European Confucius Institutes and Classrooms. I congratulate the Confucius Institute for Scotland in the University of Edinburgh for hosting this important event. I also see some new faces. This shows in less than two years, the family of Confucius Institutes and Classrooms in Europe has gained many new members. Take Britain as an example. When I attended the 2010 conference, there were 12 Confucius Institutes and 53 Confucius Classrooms. Today, the figures have respectively increased to 20 and 63. I have no doubt that when I meet you again at the next conference, the number will be even more impressive! As far as I know, more than 20 other British Universities are already waiting to set up Confucius Institutes. They have made their applications and are making relevant preparations. They all hope Confucius Institutes will be open in their universities at an early date. Apart from immense interest from universities in UK and other European countries, Confucius Institutes have been given great support at government level. Last April, high level people-to-people dialogue mechanisms were launched between China and UK and between China and EU. They were designed to promote exchanges and cooperation in education, culture, science and technology and youth affairs. In the first dialogues, all sides agreed language cooperation was an important means to strengthen people-to-people links. All parties pledged more support for cooperation in Mandarin teaching. 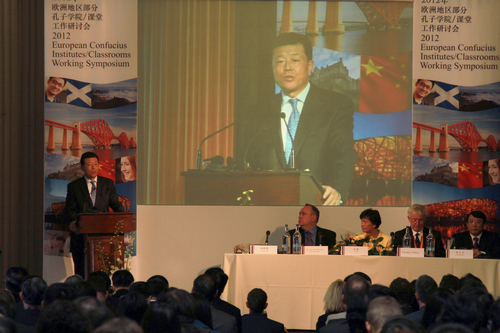 The government of Scotland is also a strong supporter of Confucius Institutes, especially First Minister Salmond. 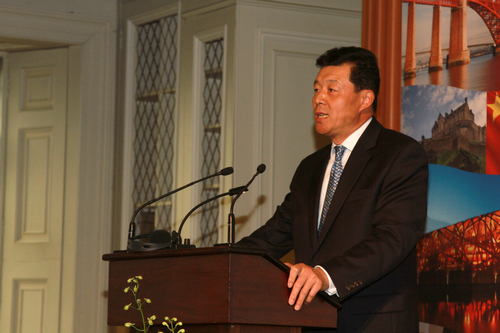 Last year he attended the launch of Confucius Institute in Glasgow University. This year, he joins us again at this conference of European Confucius Institutes. Just a few minutes ago, he delivered a very warm speech. These are all very positive trends. Yet we must have 'awareness' on two issues. · And produce more and better students. · And the Neo-Sinology International Research Plan. Dialogue on these topics is an essential step on the road to winning higher quality and sustainability. Only exchanges will lead to progress. Turning to my second 'awareness' point. We must also be 'aware' that development of Confucius Institutes is not without challenges. Some people are not comfortable to see the rapid growth of Confucius Institutes. l They cling to the outdated 'cold war' mentality. l They criticize Confucius Institutes for being a tool of China's 'national propaganda'. l They label teaching Mandarin as 'ideological infiltration'. l So they have from time to time made irresponsible remarks in Western media against Confucius Institutes. All these require you, Heads of Confucius Institutes and Classrooms, to make your case and tell your stories. You are in the best position to speak. · Confucius Institutes are jointly run by China and Britain, and by China and Europe. 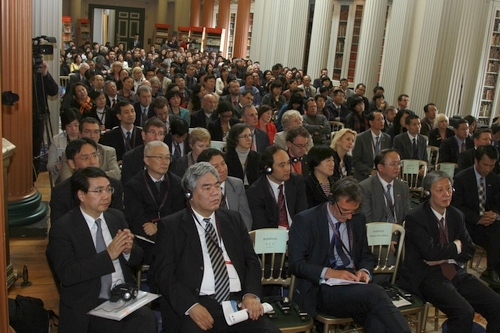 · Confucius Institutes are there to meet the huge demand of learning Chinese language in Britain and Europe. · Confucius Institutes facilitate China-UK and China-EU cooperation in culture, education, economy and many other fields. · Confucius Institutes help promote mutual understanding between peoples of China, Britain and Europe, especially young people. 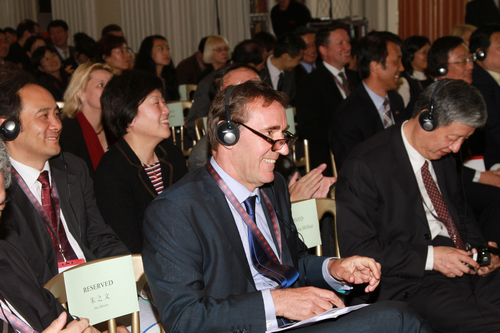 · Confucius Institutes aim to lay a good foundation for future development of China-UK and China-EU relations. I believe anyone who knows the operation model, curriculum and teaching achievements of Confucius Institutes and Classrooms will support this collaboration of China and Britain and China and Europe. I wish Confucius Institutes and Classrooms in Europe sound and sustainable growth. I hope they will make a greater contribution to deeper understanding and friendship between Chinese, British and European peoples. I also believe Confucius Institutes and Classrooms have a key role to play in building comprehensive development of China-UK and China-EU relations. In conclusion, I wish this conference a great success!